If you want to send your love to someone special, please don't choose this symbol of the grim realities of loves' battlefield. We have a perfectly lovely red heart rope soap to do that (Item #7008). However, if you want to express another emotion to that white hunter with the truly black heart then this is the soap-on-a-rope for you! 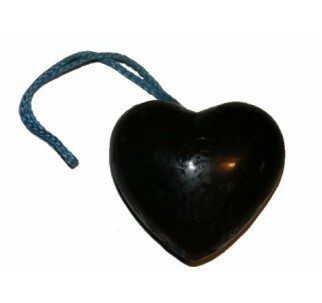 So, if you are a survivor of a black heart romance, nothing says says you are soooo over it better than this midnight black purple glycerine soap. If you want us to ship this item directly to someone, we'll be glad to include a free hand-written gift card with whatever you want to say (within reason). Just fill out the text message box above.